Could it happen here? The City of Flint's water supply has caused elevated lead levels in children in that area. In this week's 'Issues of the Environment' David Fair talks with Washtenaw County Public Health's Medical Director, Alice Penrose, about the safety of the water in this area, and the dangers of lead from other sources. * With lead in the Flint water system drawing attention nationally, should Washtenaw County residents fear exposure from drinking water? Probably not, because our water comes from safer sources that have consistently tested low for lead. * 56.5% of the housing stock in Washtenaw County was built before 1978 and 17.2% was built before 1950, therefore about 60% of children in Washtenaw County are at risk for lead poisoning from paint used in older homes before it was outlawed. * Children and pregnant women are most at risk for lead poisoning, and exposure (even minimally) can lead to behavioral and physical damage including learning disabilities, decreased intelligence, behavior problems, decreased muscle and bone growth and hearing damage. * Alice Penrose, Medical Director for Washtenaw County Public Health, says that although lead testing results for children in the county are generally good, with low or no exposure, very little testing is done. She would like to see more testing, and will hold future testing events if there is interest. Flint residents have suffered hazardous lead exposure due to the introduction of a new water source laden with chemicals which erode the older, lead-based water infrastructure. Although some homes in Ann Arbor, Ypsilanti, and the townships in Washtenaw County have similar lead piping and lead solder, the water that runs through them is likely to be from a much safer source than in Flint, and it also contains fewer corrosive elements and byproducts of decontamination, which are the primary factors in lead leaching into household water. Department (DWSD), City of Ann Arbor and private wells. * To assure that our water is safe to drink, both the state and the Environmental Protection Agency (EPA) require that water is tested on a regular basis to assure that contaminant levels are below the EPA regulations. * With all the news about the Flint water supply it might be helpful to know both Ann Arbor and Detroit water is tested for a number of contaminants including lead and copper. * The EPA developed a Lead and Cooper Rule (LCR) in order to protect the public’s health by minimizing lead and cooper levels in drinking water and all community water supplies are subject to the LCR requirements. * The established action level for lead is 0.015 mg/L and 1.3 mg/L for copper based on 90th percentile level of tap water samples. * If the action level is exceeded it triggers other requirements to minimize exposure that include water quality parameter monitoring, corrosion control treatment, source water monitoring/ treatment, public education and lead service line replacement. * Lead in drinking water is usually a result of materials and components associated with service lines and home plumbing. To help assure the highest quality drinking water and minimize the exposure to lead – flush your tap for about 2 minutes after a period of non-use before using the water for drinking or cooking. According to the EPA, “Lead can enter drinking water through corrosion of plumbing materials, especially where the water has high acidity or low mineral content that corrodes pipes and fixtures. Homes built before 1986 are more likely to have lead pipes, fixtures and solder. However, new homes are also at risk: even legally "lead-free" plumbing may contain up to eight percent lead. Beginning January 2014, changes to the Safe Drinking Water Act will further reduce the maximum allowable lead content of pipes, pipe fittings, plumbing fittings, and fixtures to 0.25 percent. The most common problem is with brass or chrome-plated brass faucets and fixtures with lead solder, from which significant amounts of lead can enter into the water, especially hot water. Corrosion is a dissolving or wearing away of metal caused by a chemical reaction between water and your plumbing. A number of factors are involved in the extent to which lead enters the water including the chemistry of the water (acidity and alkalinity), the amount of lead it comes into contact with, how long the water stays in the plumbing materials, and the presence of protective scales or coatings inside the plumbing materials. To address corrosion of lead and copper into drinking water, EPA issued the Lead and Copper Rule (LCR)<http://water.epa.gov/lawsregs/rulesregs/sdwa/lcr/index.cfm> under the authority of the Safe Drinking Water Act. The LCR requires corrosion control treatment to prevent lead and copper from contaminating drinking water. Corrosion control treatment means systems must make drinking water less corrosive to the materials it comes into contact with on its way to consumers' taps. It took concerned citizens and watchdog groups to expose and remedy the lead situation in Flint’s water. Residents of Washtenaw County ought to feel secure about low lead levels in household water for the time being, but it is advisable that more parents have their children tested for lead exposure since this type of testing can pick up red flags for changes in the municipal water. In Flint, some of the first signs that lead levels were higher that the Action Level came from concerned parents who had their children tested. The “Action Level” (where lead contamination is higher that governmental standards) for lead is 15ppb. For copper it is 1300ppm. The latest Water Quality Reports available for the Washtenaw County area come from 2014. The amount of lead and copper in our water is tested and reported annually. For comparison, 2 out of 100 Flint residents tested officially above the Action Level. No lead detected in the City or in Pittsfield, Augusta, Superior, Charter Township of Ypsilanti, City of Ypsilanti, Southwest Canton Charter Township, and Township of York; Copper was below 120ppb in all areas. * According to the Michigan Department of Health and Human Services Childhood Lead Poisoning Prevention Program, 56.5% of the housing stock in Washtenaw County was built before 1978 and 17.2% was built before 1950. * These two dates are important for different reasons – in 1978 the federal government banned lead from being added to residential paint but many paint manufacturers started to voluntarily remove lead from their products between 1950 and 1978. * It is more likely that children will become lead poisoned as a result of the home that they live in than from the water they drink. * Lead based paint was used in many homes built before 1978. Most children are poisoned as a result of ingesting lead dust. Lead dust is created when lead based paint is disturbed during remodeling, renovation and even the through normal wear and tear such as opening and closing windows. * Other sources of exposure include – soil, parent/caregiver occupation or hobby, and cultural or religious practices. * In 2013, 12% of Washtenaw County children under the age of 6 years were tested for lead. * Elevated lead levels can cause serious health problems especially for children and pregnant women. In children lead can cause – learning disabilities, decreased intelligence, behavior problems, decreased muscle and bone growth and hearing damage. * If a pregnant woman is exposed to lead during her pregnancy or was lead poisoned as a child, he lead can be passed to her unborn baby. Possible risks include miscarriage, preterm birth and low birth weight babies. 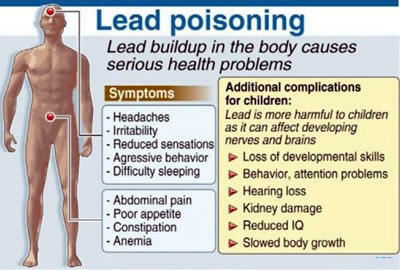 * Lead poisoning does not often have any symptoms. Children may have an upset stomach, poor appetite, constipation, hyperactivity, irritability or difficulty sleeping. * There are simple things that you can do to keep your family safe – wash children’s hands, toys and pacifiers often, take off shoes when entering the house, use cold tap water for drinking and cooking, wet wipe floors, windowsills and baseboards, check your home for lead hazards and use lead safe work practices when remodeling or renovating. * Get your child tested for lead if you have concerns or live in a home built before 1978. * Lead testing in minimally painful and requires only a fingerstick, similar to a blood sugar test. * Jane Nickert, Public Health Nurse for Washtenaw County says that although children in Washtenaw County generally have very low exposure during lead testing, very little testing is actually done here. She suggests more children ought to be tested, and says the test is a finger stick that is virtually painless. Washtenaw County has held lead testing events in the past and may do so in the future if there is interest.